Yasuo Fukuda, the frontrunner to succeed Japanese Prime Minister Shinzo Abe, said on Saturday that he would stay away from a Tokyo shrine seen by Asian neighbors as a symbol of Japan's past militarism if he were chosen as the nation's new leader. Fukuda made the remarks when he formally announced his candidacy for the ruling Liberal Democratic Party (LDP)'s presidential election. He told a joint press conference held at the LDP headquarters in the afternoon that Japan should build a secular national memorial facility to commemorate the war dead, adding that "there is no need to do things that others hate," according to the reports from Kyodo News. 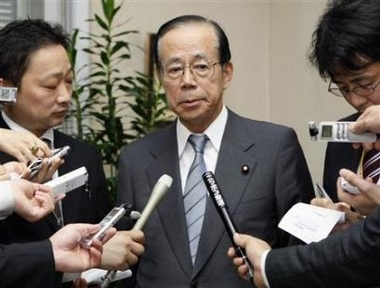 Fukuda is one of the most Asia-friendly Japanese politicians and has close ties with China. He proposed to build a surrogate national war memorial facility during his time serving as chief Cabinet secretary in Junichiro Koizumi's Cabinet. LDP Secretary General Taro Aso also filed his candidacy for the party helm Saturday morning. The two candidates agreed on the need to extend the Maritime Self-Defense Force's refueling mission in the Indian Ocean and vowed to continue the course of structural reforms, the Kyodo News reported. It is currently a general estimate of Japanese media that Fukuda is set to win in the duel to succeed Prime Minister Shinzo Abe as eight out of all nine LDP factions have extended their support for the seasoned politician. The LDP decided Thursday to hold the presidential election on September 23 to pick a new president to replace Abe, who expressed his intention to resign Wednesday. The LDP president will be naturally appointed prime minister since the party enjoys the majority in the House of Representatives, which holds the decisive power in the Diet.